Understanding Why You May Need Commercial Renters Insurance | The Voss Law Firm, P.C. Will Your Commercial Renters Insurance Save You After a Large-Loss Fire? Most business owners in the U.S. do not own the property that houses their operations. Instead, they choose to lease or rent office space near well-traveled areas, allowing them better access to potential customers. While this arrangement benefits both the building owner and tenant, insurance regulations in these situations can become confusing. Many tenants assume that they are covered under the insurance company of the person they have rented the business space from, only to discover that this coverage pays only for damage to the building itself. In order to protect their business holdings, attorney Bill Voss recommends that commercial tenants purchase their own commercial renters insurance and examine the policy carefully to make sure all of their losses will be covered. Who Needs Commercial Renters Insurance? Commercial renters insurance, also called tenants’ insurance, covers the damage or destruction of property due to vandalism, weather conditions, building malfunctions, and of course, fire. Nearly all commercial property owners need some form of insurance to cover fire losses, including apartment complex owners, renters of commercial warehouse and storage units, and retail tenants in shopping complexes. Not only does renters insurance protect from losses in major property damage situations, it also provides liability coverage to protect the tenant and his business from being named in a lawsuit. Contents of the unit. A rental space houses all facets of a business’ day-to-day operations, including furniture, computers, phones, printers, files, stock, appliances, and more. Depending on the commercial renters insurance policy, tenants can be reimbursed for the actual cash value or replacement cost value of lost items, allowing them to minimize their time spent out of business. Theft. It is not uncommon for businesses to suffer theft of personal belongings or office equipment after a fire due to looting. Some policies provide for losses due to theft in standard commercial property coverage, while others offer the coverage as an optional extra. Damage to the structure. A tenant can be held liable for fire damage to the building if the conditions of the tenant’s building were responsible for causing the fire. This includes any negligence on the part of contractors or employees that could have led to damage of the building. Injuries on the property. Renters insurance policies typically offer a premises liability provision to cover any injuries that occur on the business site. If a customer was injured while shopping as a result of the fire, your insurance policy could pay for medical bills and lost wages—and possibly more if the customer files a lawsuit. Damage to other tenants. 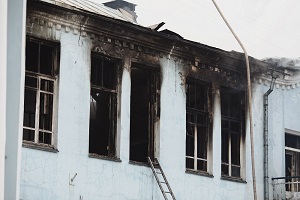 Just as the owner of the building can seek compensation from you if a fire originating in your unit damaged the structure, the tenants next to your unit can seek payment for losses due to fire or smoke damage. Business interruption. Most businesses will need days or even weeks to get their daily operations back up and running after a fire. If your policy offers business interruption coverage, your insurer can pay for business-related expenses and estimated profit losses for a set period of time after the fire. Commercial rental insurance policies vary depending on the location of the property, risks of your business venture, and choices you make in your coverage. For instance, the amount a tenant can collect after a fire may be thousands of dollars off of the expected payout because a planned sprinkler system was never installed, or because the policy was never updated from the cheapest level of coverage. When choosing this type of insurance, it is important to examine the coverage limits the landlord has chosen for the building, since this policy can overlap or conflict with your own coverage. One of the most important things to consider is ensuring that anything that is not covered under the business owner’s insurance is covered under your own policy. Always find out what kind of insurance your landlord has before you sign the lease, and update your own policy regularly to cover any additions or changes you have made to the unit. If you are having difficulty getting fair payment for losses after a fire, we can help. The Voss Law Firm, P.C., holds insurance companies accountable for the coverage that you have paid for. For questions about your commercial insurance policy, or for help negotiating with the insurance company regarding a claim for losses, fill out the contact form on this page today.